White Flower Farm's Hydrangea macrophylia "Endless Summer"
Native to Japan where hydrangeas are beloved not just for their full, lush blooms, but also for the tea made from their leaves, hydrangeas have been cultivated in Western gardens since the 1730s. Those ubiquitous but unfailingly gorgeous pompom flowers seen in gardens across the United States are often bigleaf hydrangeas, or Hydrangea macrophylla, the most popular of the 23 species available. This species is further divided into hortensia, featuring balls of flowers, versus lacecaps, which have flattop flowers. Either way, find the perfect spot for these shade-loving shrubs and get some hydrangeas into your garden now before it’s too late. 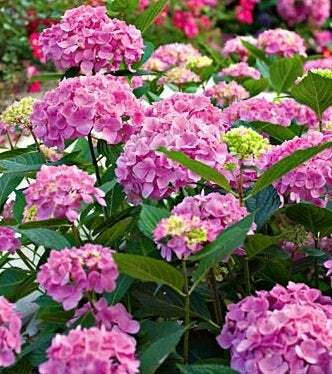 Hydrangeas should be incorporated into your garden in early summer or late fall. Look for an area in partial shade (think strong morning sun and afternoon shade) and well-draining soil. 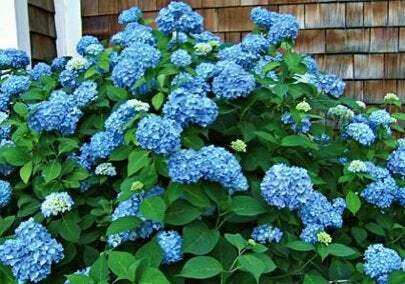 Stay away from the roots of trees, which compete with your newly established hydrangea. Get your plant from a nursery; don’t try to use one of those aluminum foil-wrapped options picked up from the grocery store (those are forced blooms meant for one season of display). Once established, don’t let that hydrangea dry out—keep it well but not overly watered. Lay down some quality mulch to help keep in moisture. Bigleaf hydrangeas and most other common species bloom on previous year’s growth, which means the time to prune is right after blooming. New flower buds will start forming in late summer, so don’t procrastinate. Take out the faded flower heads and cut back excess shoots to shape the shrub and encourage blooms for next year. White Flower Farm's Hydrangea macrophylia "Let's Dance Moonlight"
Since bloom color in many hydrangeas is affected by the amount of aluminum in the soil, you can do a little adjustment to get your hydrangea to go from pink (alkaline soil) to blue (lower soil pH). It won’t show up this summer, but next year you can see the results of your experiments. Incorporate about eight ounces of aluminum sulphate into the soil or try adding grass clippings, coffee grounds and potassium-rich fertilizer to lower the pH and go for blue. For pink, you can mix limestone into the soil for a more acidic environment and a fertilizer with phosphorous to help eliminate any aluminum already in the soil. Next year you might end up with pink, blue, or even purple blooms.